Time 4 Dogs: Words MATTER - SHOP! Don't "Adopt!" Words MATTER - SHOP! Don't "Adopt!" Think it's "cute" to say you "adopted" a "rescue" who is now your "furkid?" Well, it's not really "cute" at all if you give it some thought.The words we use matter. Did you know that the state of California passed a law a few years ago that removed the word "pound" or "impound" from all prior animal legislation and replaced it with the word "shelter?" Like it or not, words have definite meanings that affect public opinion and form the cultural zeitgeist. Why do you think they legally changed the word "pound" to "shelter? ".....even though they maintain the right to capriciously kill in the so-called "shelter?" Because the name you tag something with forms it's public image. Perception becomes reality. Animal Rights people co-opting the terminology we use is very dangerous, it's not benign, and it's aimed squarely at legally removing our ownership rights. "Rescue" implies animal abuse. "Adopt" infers a status equal to humans. "Guardian" instead of "owner" means the pet has inherent rights that supercede your right to determine his care and destiny. If pets are "fur kids" the state can step in and mandate how you care for them down to minute details. Kiss your pet ownership rights goodbye. The "Adopt don't Shop' mantra has been very successful at demonizing breeders. it's time to turn it around! Get a great pet....SHOP! Shopping is a good thing. Most shoppers thoughtfully research before they make a purchase. When it comes to a pet, research prior to purchase is important. 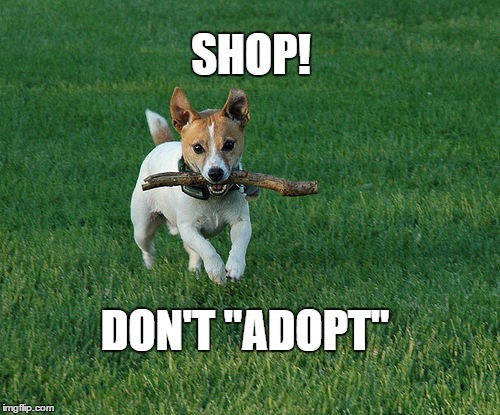 Avoid those "adopt-a-thons" where impulse buying is encouraged, and you might just end up with a dog who doesn't suit your lifestyle or home situation. SHOP...and get the dog that is right for you to OWN! !